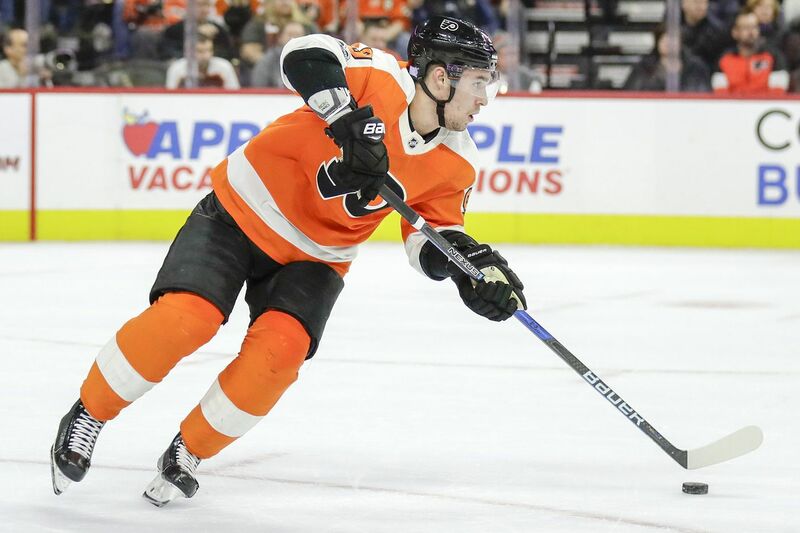 General manager Ron Hextall is hoping Ivan Provorov and the rest of the Flyers' young defense takes another step forward this season. As training camp looms, the Flyers are aiming for their first Stanley Cup championship since 1975, the longest title drought among Philly's pro sports teams. Oddsmakers say the drought won't end, but this is clearly the best team since Ron Hextall became the general manager in 2014. The Flyers, who added high-scoring left winger James van Riemdyk in the offseason, have a good blend of youth and veterans. They had the fifth-most points in the NHL from Dec. 4 until the end of last season, overcoming a slow start that included a 10-game losing streak. "Your young kids should get better every year, so our group is a year more mature," Hextall, whose team went 42-26-14 (98 points) last year and finished third in the highly competitive Metropolitan Division, said on Friday. "They're a year together and that does make a difference. Every year our group is together, the chemistry should come together. If our veterans play like they played last year and our kids take a little bit of a step – and you throw JVR in there – we should be a better team. "We expect to take a step this year." Van Riemsdyk will bolster an already-formidable top-six – the team's No. 1 strength. If the Flyers are going to win their first playoff series since 2012, the first two lines will lead the way. The last time we saw the Flyers, they had blown a 4-2 second-period lead at home and were eliminated by the hated Penguins, 8-5, in the opening round of last season's playoffs. If they had won, Sean Couturier would have been remembered as the Kirk Gibson of hockey. Despite playing with a torn medial collateral ligament in his right knee, Couturier scored a hat trick and had five points in the Game 6 loss. It was also the game that Ivan Provorov tearfully took the blame for the loss because he committed two third-period turnovers that led to goals, including the game-winner. Fact is, he gallantly played through a separated left shoulder and had problems stickhandling and shooting. Provorov, who is blossoming into one of the NHL's best all-around defensemen, is healthy again. Couturier isn't, and his recovery from another knee injury – suffered in a benefit game Aug. 10 — will be one of the main issues during training camp, which will open Friday at the Skate Zone in Voorhees. 1 Will Couturier recover from a knee injury and duplicate his breakthrough season? Sean Couturier scored a career high 31 goals and 76 points playing as the Flyers’ top-line center last season. Hextall turns into Alfred E. Neuman when asked about Couturier's health. Newman's motto was, quite simply, "What, me worry?" The GM says he expects Couturier (31 goals, 76 points) to "absolutely" be 100 percent by the start of the season and is about ready to resume skating. When healthy, he will center a line that will have captain Claude Giroux (102 points) on the left and, most likely, Travis Konecny on the right. Konecny scored 20 of his 24 goals in his 41 games on that unit last season. He had just four goals in his 40 other games on other lines. That explains why coach Dave Hakstol enters the season with Konecny penciled in on the top line. "He brought a good element to that line; he brings a different dynamic with his style of play and it brings another dimension to the other two guys," Hakstol said. "Now it's got to grow and mature." The second line should have the blossoming Nolan Patrick centering van Riemsdyk and Jake Voracek. 2 Can 19-year-old Morgan Frost, a prolific scorer in juniors, make the team as the third-line center in training camp? Morgan Frost, looks on during the Flyers’ development camp back in June. That seems like a long shot, but never say never. "I don't like talking about one player because we have players who are accomplished players at this level," Hextall said. "To say he's going to come in here and fight for a spot, that's truly up to Morgan Frost. He has to come in here from day one and show us, 'I'm a special player right now and I deserve a look at this level.' He dictates that, not me." Jordan Weal goes into camp as the favorite to win the third-line center spot, while Scott Laughton and Jori Lehtera are also in the mix. "We have guys that are more accomplished, so they have a head start on any young player," Hextall said. "If the young player comes in and proves he's better than them and we believe that young player can help us the entire season and not hurt his development, then we'll consider those type of things." 3 Is the goaltending good enough to make the Flyers a legitimate Stanley Cup contender? Goaltending prospect Carter Hart is aiming to make the team out of camp, but will likely need some time to develop in the AHL first. Probably not, but you-know-who is climbing toward the NHL. Projected starter Brian Elliott (2.66 goals-against average, .909 save percentage) is solid when healthy. But there are questions about whether he is all the way back from February abdominal surgery and a minor hip procedure — Hextall called it a "cleanup" — in the summer. "People forget how good he was for three-quarters of the year," Hextall said. The talented but injury-prone Michal Neuvirth (2.60, .915) will have to show he can stay healthy for an entire season. "We expect both guys to play in the preseason, probably the back end of it," Hextall said. Waiting in the wings is Western Hockey League sensation Carter Hart, the franchise's future goalie. Hart, 20, thinks he can make the team in camp. Realistically, he needs some seasoning with the AHL's Phantoms before making the leap from juniors. But if a goalie goes down with an injury in, say, January and Hart is lighting it up with Lehigh Valley, well, it wouldn't be out of the question to see him with the Orange and Black. Steady Alex Lyon will also have a chance to impress in camp, along with Anthony Stolarz, who is healthy after undergoing a pair of knee surgeries last year and missing most of the season. 4 Will the young defense, which had growing pains last season, make significant strides? Robert Hagg made the Flyers’ roster to start last season, and the team will look for him and other young defenseman such as Travis Sanheim to take a step forward. The Flyers are counting on it — and desperately need it to happen if they are going to climb the standings. With a year of experience under their collective belts, Robert Hagg and Travis Sanheim should be much improved. Free-agent signee Christian Folin has, in essence, replaced Brandon Manning, and Hakstol spoke highly about what he will bring to the team. The top unit is expected to be composed of Provorov and Shayne Gostisbehere. Veterans Andrew MacDonald and Radko Gudas also should be regulars. 5 How can the much-maligned penalty-killing unit make improvement? Travis Konecny could be an option to help strengthen the Flyers’ penalty kill this season. The penalty kill, which was successful just 75.8 percent of the time last season, could have a new look. The speedy Konecny is among the players who will be given a chance to crack the unit in the preseason, and newcomer Folin, a 6-foot-3, 205-pound righthander, could also work his way onto the PK if he isn't the seventh defenseman. From here, the PK was much too passive last year and needs to put more pressure on opponents at the top of the circles. "The coaches have worked extremely hard this summer to evaluate, study it," Hextall said of the penalty kill, which was 29th out of 31 NHL teams last season. "I go back to the final 22, 23 games and we had a pretty good penalty kill. If we didn't have that, I probably wouldn't be as optimistic about it." They have eight preseason games to refine it before the season starts Oct. 4 in Las Vegas.